LOS ANGELES, CA / ACCESSWIRE / September 12, 2018 / Tyler Day and Peter Day, co-founders of the digital marketing agency Optimize To Convert, are pleased to announce the launch of their newly-revised website, which they plan to use to help at least 100,000 entrepreneurs grow their businesses through internet marketing. To check out the newly launched website and learn more about the innovative services that Optimize To Convert offers, please visit http://www.optimizetoconvert.com/. As a company spokesperson noted, the Day brothers' backstory helps to make them and their company stand apart from other digital agencies across the U.S.
Tyler and Peter first partnered together when they were teenagers and they started their own landscaping business. Through traditional advertising efforts including flyers and cold calling, the Day brothers immediately learned the power of marketing as they very quickly acquired more clients than they could even handle. "After years of grueling landscaping work the Day brothers decided to take their efforts digital," the spokesperson noted, adding that they began to have small scale success promoting other people's products and services online as affiliates. The Day brothers quickly discovered that this type of work was much more rewarding for them—primarily because they were no longer trading their time for money. The more work they put in, the more successful they became. They learned about the power of residual income and creating a business that earned money 24/7, whether they were working that day or not. While they enjoyed the type of work that they were doing with their digital marketing company, the spokesperson noted that they were not satisfied with the firm's results. After investing into personal development, courses and looking for mentors who could help them, all of that began to change. Describing their success as a "Lawn Mowing to Web Riches" story, the spokesperson noted that Peter Day and Tyler Day are now considered top experts in the lead generation industry. "Together they run one of the most promising digital marketing agencies and are growing faster than ever. They are a marketing duo you will want to keep your eye on," the spokesperson noted, adding that with the recent launch of their newly-revised website, the Day brothers hope to reach even more clients, specially looking to reach at least 100,000 entrepreneurs and business owners and help them scale. In addition to the new site and continually working at generating leads and sales for other companies, the Day brothers are now working on plans to teach other people how they can create their own web based businesses. The Day brothers are putting a focus on sharing their business knowledge with a series of digital courses set to release by next year. "Their aim is to train the next generation of digital entrepreneurs to go out and find success just like they did," the spokesperson noted. Optimize To Convert is a digital marketing agency that specializes in generating leads and sales on a national scale for a wide variety of companies. 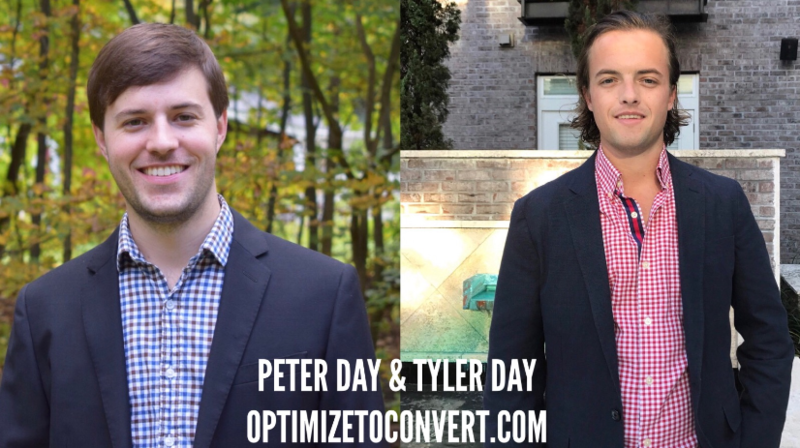 On a typical day, brothers and company co-founders Tyler Day and Peter Day generate over 3,000 leads for their clients in verticals ranging from real estate to insurance. For more information, please visit http://www.optimizetoconvert.com/.